Assuming no surprises in the second half of the year, China's growth in 2016 will remain near the target of 6.5 percent reflecting structural transition in the mainland, secular stagnation in the West and post-Brexit tensions globally. 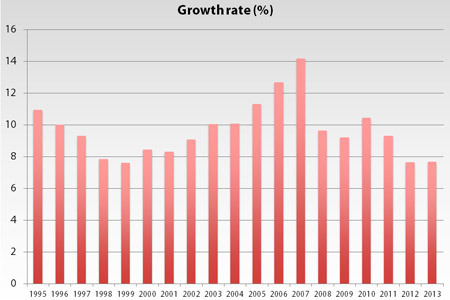 Graph below showing China growth rate from1995 through 2013 is from Blue Note. In mid-July, China's second-quarter GDP figures beat estimates with a 6.7 percent expansion, thanks to support by a slate of stimulus measures from the government and the central bank. In the next two quarters, China's growth is expected to decelerate to around 6.5 percent or less. In annualized figures, the quarterly data indicates an expansion of nearly 6.5 percent, which remains close to the ambitious target of 6.5-7 percent. At the same time, the consumer price index (CPI) is likely to increase to 2.5 percent. In the US, fiscal conditions have tightened and rate hikes remain on hold. In Europe, expansion relies excessively on central bank's quantitative easing and ultra-low rates. In Japan, Prime Minister Abe is pushing still another huge fiscal stimulus, while central bank is relying on negative rates and aggressive monetary injections. In this international comparison, the People's Bank of China (PBOC) looks almost conservative as it has allowed the deflation of some asset bubbles. Nevertheless, while the PBOC may not resort to policy rate cuts, it is likely to engage in further cuts of reserve ratio requirements (RRR), which will reduce the amount cash banks need to hold. As a result of leverage, Chinese banks' non-performing loans (NPLs) have increased, while concerns have risen about asset quality, due to credit expansion. Between 2007 and 2014, debt-to-GDP ratios rose in major advanced economies, by more than 50 percentage points in many cases. During the same period, China's debt quadrupled to $28 trillion, fueled by real estate and shadow banking. Unlike major advanced economies, China can still manage its debt on the back of growth. In the US, government debt exceeds 105 percent of the GDP, while below 2 percent growth is not adequate to contain the challenge. What's worse, Washington lacks a credible, bipartisan and medium-term debt plan. In the Euro area, government debt exceeds 96 percent of the GDP, while 1 percent growth is inadequate to defuse the challenge. What's worse, while Brussels may have political will to contain the debt burden, it lacks the institutions to do so. Nevertheless, China's credit expansion remains about 13 percent; twice as high as the country's growth pace. Moreover, concern is increasing about shadow banking-associated indebtedness. Understandably, none of these reforms can happen overnight. But many of them must occur in the medium-term. The second half of the year will provide a better idea of the policymakers' preferred balancing act between policy accommodation and reform timetable. And that, in turn, will determine the pace of growth deceleration in the coming years.